Without hesitation, it reappeared on the near side along the trail the cut through the tall grasses and the open gate in the barb wire fence that surrounds the grazing area. With purpose, the animal’s head went up, and against the light grassy backdrop, I picked out the dark tines that went just over the top of the buck’s ears. While I conducted a brief mental debate on shooting the smallish buck (while clipping my release to my bowstring) and figuring on this being my last bow hunt of the year, or at least before gun season starts, he stamped a couple of times and stared into the open in an attempt to make out the source of the voice at the far side of the lot where I sat 15 feet up in the air. 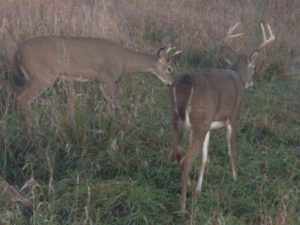 The buck turned and stared north to the far corner of the lot and then took a dozen cautious steps toward the middle of the field and hung up in the last remaining patch of green in the hayed area. When he dropped his head, I gave two more grunts that caused his neck to snap back up like a rubber band and his black-marble eyes eyes burned in the direction of the tree I hung from. He bounded forward another half dozen steps, closing the distance to about 60 yards. At that point I surmised that while he wasn’t the largest buck in the area, he’d be a good first bow buck and a fitting end to an otherwise challenging season on stand which continued last year’s comedy of errors and learning experiences. He glanced at my tree, and then stared again to the north, and made a series of posturing moves, spinning in a circle, lowering his head and raising it to the unseen opponent. For a second, he turned away, and in a final attempt to get the deer to close the distance to a comfortable shooting range, I gave two more grunts. The buck paused, but instead of looking at me, he lowered his head and faced the north corner of the field, posturing defensively. Frustrated by his unwillingness to charge the sound, and surprised by his reaction in an off direction, I glanced downward as the adrenaline began to subside in my veins, and as I did, I caught the slightest hint of deep gray in the otherwise yellow-and-green field to my north.